This image shows an artist's illustration of NASA's Lunar Reconnaissance Orbiter at the moon. LRO and the Opportunity rover mission on Mars are currently zeroed in the space agency's 2016 budget request. THE WOODLANDS, Texas — Despite a forward-looking and overall healthy NASA planetary science program budget, two on-duty spacecraft are now on the chopping block. The government's current budget proposal for NASA just isn't enough to cover everything, said James Green, head of NASA's Planetary Science Division. Green noted that the Lunar Reconnaissance Orbiter and the veteran Red Planet robot, the Opportunity rover, are now zeroed out in President Obama's NASA budget for fiscal year 2016. "So stay tuned on that," Green told the space scientists, but said that programmatic decisions "are tough." Launched on June 18, 2009, NASA's Lunar Reconnaissance Orbiter (LRO) continues to collect an impressive amount of data, adding new knowledge about the moon. 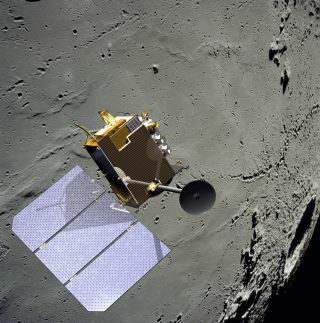 "Continuing the LRO mission is truly 'high value for few dollars' science," said Paul Spudis, a space scientist at the Lunar and Planetary Institute in Houston. LRO is in a stable orbit circling the moon, Spudis said, and continues to obtain outstanding, high-resolution images of the lunar surface, shedding light on the moon's history and processes. NASA's Opportunity rover recently completed the equivalent of a marathon distance on Mars. "If we can continue to operate LRO for the next few years, we may eventually obtain a global high-resolution map of the entire moon," Spudis said. This data set will be used for decades to come and will allow the identification of new sites for exploration, utilization and, eventually, habitation, he said. Spudis also points to another facet of LRO's duties – an ability that was previously shut down due to a money shortfall. "I believe that we should take additional bistatic radar data," Spudis said, making use of radar pulses blasted to the moon via the Arecibo radio telescope in Puerto Rico with echoes picked up on the Miniature Radio-Frequency instrument (Mini-RF). It is a synthetic aperture radar instrument mounted on LRO. Doing so, Spudis said, would "uniquely indicate the locations and amounts of polar ice" on the moon. He is a team member on the Mini-RF experiment. The Mini-RF radar is currently shut by lack of funding, Spudis said, "but it could be started up again to conduct bistatic measurements. This is an entirely new mission for lunar polar volatiles, as we have collected only demonstration amounts of bistatic radar to date," he added. "Using LRO for as long as possible makes economic, operational and scientific sense. It's a lot of bang for the buck," Spudis said. Mars researcher, Steve Squyres, thinks that continued funding of Opportunity is warranted. At distant Mars, also eyed for shutdown is Opportunity, the venerable Mars Exploration Rover (MER). The robot has been wheeling about on the Red Planet for more than 11 years now, following a January 2004 landing in Eagle Crater. "I'm convinced that continued funding of Opportunity is warranted, and I'm not alone," said Steve Squyres, Opportunity principal investigator at Cornell University in Ithaca, New York. Recently, NASA conducted a "senior review" of all of its ongoing planetary missions, Squyres told Space.com via email. This was a comprehensive evaluation of future science potential per dollar, involving written proposals submitted by the project teams, and rigorous outside peer review. Opportunity came out tied for first place — with NASA's Mars Reconnaissance Orbiter — among all ongoing Mars missions, Squyres said. "The rover is in excellent health, and is poised now just outside Marathon Valley, where orbital data indicate significant concentrations of clay minerals that could provide evidence for past habitable environments. The prospects for important discoveries there and beyond are good," Squyres said. For these reasons, Squyres said that he hopes and expects that NASA will find the funds necessary to keep Opportunity's wheels on a roll to do science on Mars. Closing down the Opportunity rover mission in fiscal year 2016 would preclude further exploration of the rim of the ancient Endeavour impact crater, said Ray Arvidson, MER deputy principal investigator at Washington University in St. Louis. "Over the past year we have found — using Opportunity's ability to roam and make measurements — evidence for diverse rim rocks and structures, and what is likely pervasive alteration by aqueous fluids," Arvidson told Space.com. Arvidson said that the robot's current position, just to the north of Marathon Valley, on the Cape Tribulation rim segment, is an area where orbiting sensors show an extensive set of outcrops with evidence for smectite clay minerals formed in an aqueous environment. "Exploring and characterizing these outcrops will provide new and important information on past aqueous conditions and implications for habitability, themes central to NASA's Mars Exploration Program objectives," Arvidson said.